Sushi offers a variety of options. 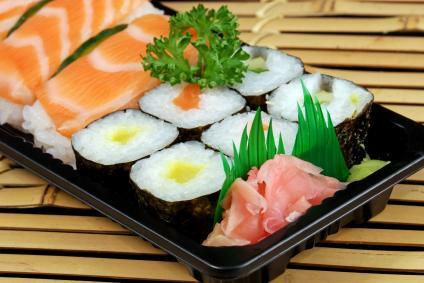 More restaurants are serving Asian food and the interest in preparing such delicacies at home has risen, so an easy sushi recipe will help cultivate your Japanese culinary skills. Sushi is not only tasty, but a healthy treat. Sushi is popular in Japan where sushi bars can be found in every city. 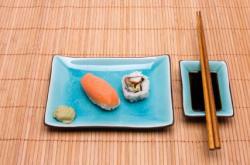 The origin of sushi dates back to China where rice and fish were fermented and served. Over the years, the fermentation process was eliminated. Today, rice for sushi is mixed with rice vinegar, salt, and sugar. Sometimes rice wine, known as sake, is also used. 'Nigirizushi'- The most typical is sticky rice flavored with vinegar and topped with raw, or fresh, fish (sashimi). The rice is formed by hand in a clump and the fish or grilled egg is placed on top. Sometimes the fish or egg is secured by a strip of seaweed. Complimented by wasabi, also known as Japanese horseradish, most restaurants serve nigirizushi in pairs. 'Makizushi' - Rice wrapped in seaweed (nori) with vegetables or seafood make this a favorite. 'Temakizushi' - Literally this translates as sushi for your hand. Vegetables and fish are placed in a pocket of seaweed. 'Inarizushi' - Easy to eat, this rice flavored with sweet rice wine is inserted in a pouch made of tofu. 'Chirashizushi' - This seasoned rice is served in a bowl with mushrooms, carrots, other vegetables, and strips of seaweed. Sashimi is served with shoyu and wasabi. Western influence has created its own non-traditional makizushi. Although popular in the United States, the California Roll is not authentic. Neither is the Caterpillar Roll or the Philadelphia Roll. Inserting avocados and cream cheese into a roll is purely an American specialty. If slicing portions of fresh fish is not your cup of tea, don't abandon the idea of making sushi at home. An easy sushi recipe will help you realize that creating stuffed tofu pouches of vinegar rice can be simple to try. These pouches are sweet to the taste and enjoyed by people of all ages. In Japan, inarizushi is often taken on picnics and packed in school lunches. Cook the rice in boiling water in a saucepan with a lid, or steam the rice in a rice cooker. Boil the rice with a 2-inch square of kombu to give it the needed flavor. While the rice is cooking, make the seasoned sauce. Mix sugar, sake, salt, and sesame seeds together. With your fingers or with a wooden rice paddle, fold the hot steamed rice with the seasoning. Put the rice mixture aside while preparing the tofu pouches, or koage. In a large shallow pan, simmer the soy sauce and sugar until the sugar dissolves. In another pan, boil water. Place the koage into the boiling water. Do not let any of the edges touch. As the koage cooks, it will soften. Remove each piece with chopsticks and pat dry with paper towels. Add sake to the simmering soy sauce and sugar. Drop the koage into this pan and cover. Saute the koage for a few minutes. When the koage has soaked up about half the sauce, turn each piece over. Let the other side get drenched in the sauce. With chopsticks, place each piece of seasoned and browned koage on a plate. Every piece needs to cool before handling and stuffing. After it has cooled, cut each koage diagonally. Open up each pouch and squeeze a clump of the seasoned rice in your palm. Shape it to fit inside the pouch. Fold the edge of the pouch to secure the rice inside the tofu pocket. Arrange the filled pouches, or inarizushi, onto a platter and serve with pickled ginger.